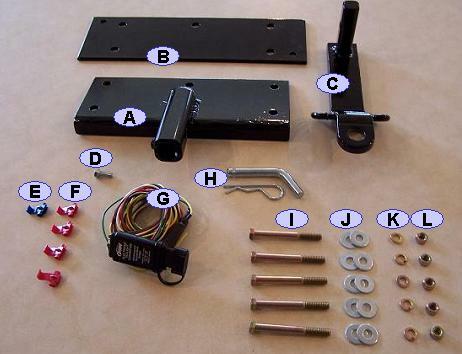 Where can I get a light duty tow hitch for my '03 350Z?? for extra passengers - or dogs. that will seriously screw up your transmission, i appraise cars for carmax and see all types of cars (corollas, miatas, civics etc.. that have tow hitches and burned out transmissions. not worth it, please it would ruin the look of your ride..
why the hell would you buy a Z car if you wanted to haul anything? You dont deserve one, and thats sad coming from a 19 year old. Pathetic...just pathetic. Eh, as long as you keep the weight low, you shouldn't hurt anything. I believe that someone on this forum was working on a tow hitch that welded to the rear bumper. This seems like a good idea if you track the car, i don't know what all the flaming is about. For reals. I have the hidden hitch made by Roark who is on the board. It easily uninstalls out of site and it actually just saved my bumper from getting rear ended last week. The stupid girl wasn't looking and bumped the hitch luckily instead of the bumper. For all that are flaming you obviously havn't tried fitting track rubber in the car. And I don't know about you guys but I can only drive one car at a time. I've been selling a few of these here and there since the group buy. Just word of mouth at the paddock. I've been toying with the idea of another group buy to make some more at a better price, but would need a dozen to make it work out. Dman, glad to hear the hitch worked out for more than just hauling tires. you or roark have any pics of the hitch, price? its tough putting 4 tires in the z. never a fun time. from the owners manual, u can tow 1k lbs, with only 10-11% of the weight on the hitch. roark, id be willing to buy a hitch! I got flamed for this when I asked too. 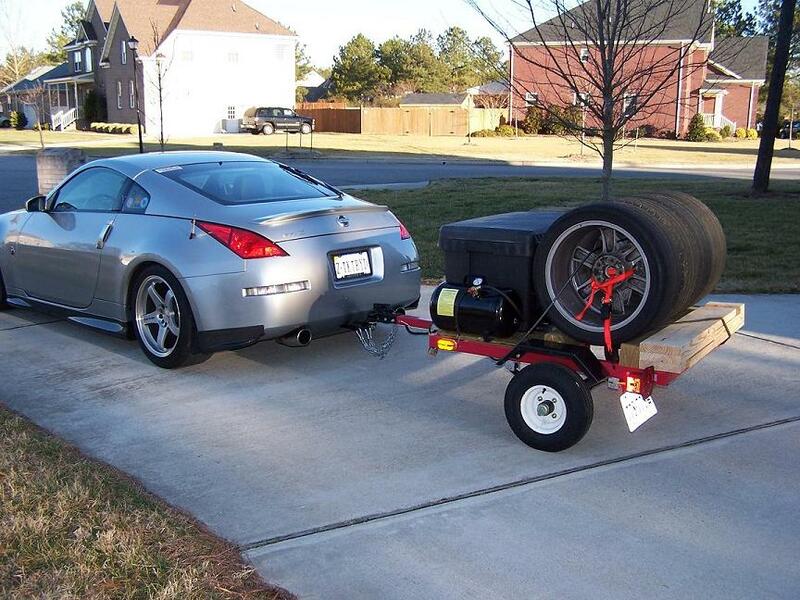 Just because its a sportscar doesn't mean it can't tow. I plan on taking my seadoo's to the lake with me Z on occassion. My parents tow a 12' enclosed trailer with 2 harleys behind their corvette with no problem as well. Not everyone can afford more then one car/truck. I have a truck for extensive hauling but when I go to the lake with my girl I wanna have my car to play around on the twistie roads when we aren't on the water. Roark's hitch works great for me. I towed my race trailer from Vancouver, WA to Topeka, KS and back. Unless I looked back, I couldn't even tell it was there. 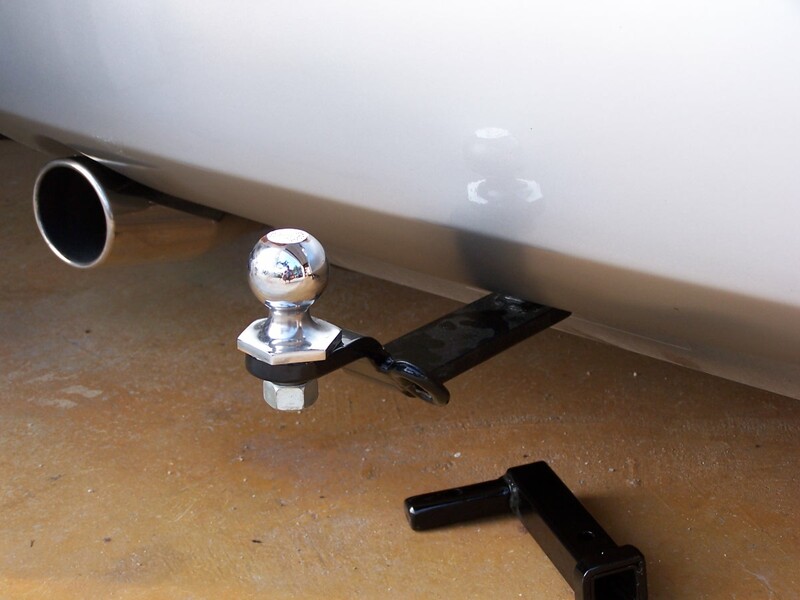 Way too many people think that once they get a trailer hitch, they can pull whatever they want, regardless of weight. Another thing is that a lot of people pull with their automatic transmission in overdrive mode. Last edited by roark; 10-24-2005 at 07:35 PM. Are you Pete's dad? If so, what track tires did you end up getting?